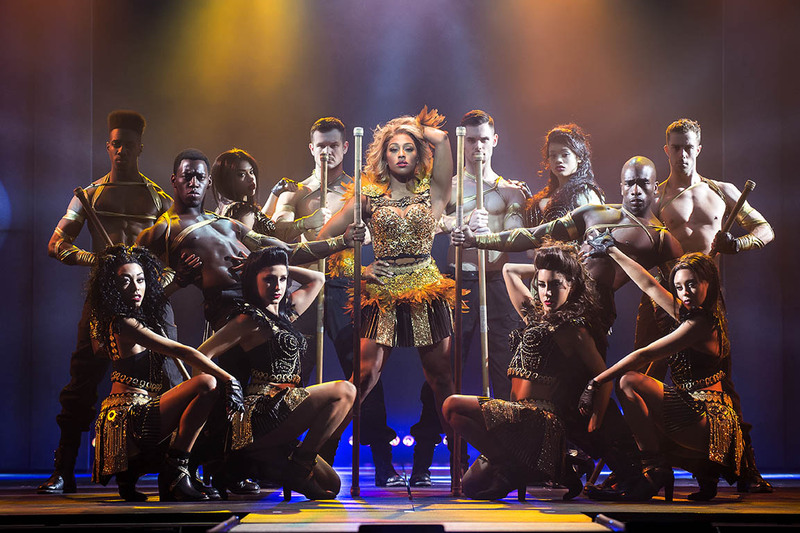 If you like the evening to go with a bang, check out Alexandra Burke as Rachel Marron, in The Bodyguard. The production opens with an enormous crash that shot everyone out of their seats. This introduced a terrifically raunchy, Queen of the Night, the star shimmering and shaking, blasting out her vocals. The music echoed around the theatre as energetic male dancers did their bare chested moves with a dazzling lighting display. Since she last starred as the superstar Rachel Marron in the West End, Alexandra Burke has reached the finals of Strictly, appeared in Chess the Musical and is turning into an authentic musical theatre star. In this touring production, she shows her tremendous vocal power and delivers Whitney Houston songs with great gusto. However, she also sings the more intimate songs with great feeling. The story is a familiar one, big star is followed by a stalker and hires a bodyguard. They fall for each other, but it doesn’t work out. If you love the songs of Whitney Houston, this is the musical for you. However, although it follows the story of the film, it is in a simplified form, and is really just a vehicle for the star of the show to deliver the hit songs. Each scene is a set piece that leads to one of the familiar Whitney numbers, but unfortunately, this doesn’t drive the narrative along. The show is really a juke box musical, the storyline being incidental as each scene stops for a great production number. All the famous songs are there including, All the Man I Need, I Have Nothing, I’m Every Woman, Run to You, Where Do bBoken Hearts Go, The Greatest Love of All, and of course the big number I Will Always Love You. At the start of the musical, Alexandra’s character behaves in such an abrasive manner, that the change to a romance with the bodyguard happens too quickly, and is not really believable. In the quieter moments he seems to be developing an attachment to the star’s sister Nicki (Mucha Richardson) which isn’t supposed to happen as he is Rachel’s love interest. Mucha, also has a powerful vocal delivery, but it has a softer tone than Alexandra’s. She gives a lovely sympathetic performance as she is also in love with the bodyguard. Frenchman, Benoît Maréchal gives an understated performance as Frank Farmer the bodyguard. It isn’t helped that the character is underwritten. Even in the film this part was not developed and Kevin Costner sleepwalked through it. All we know about Frank as a person is that his mother died, and there is a distinct lack of emotional involvement. It's a shame Benoît had to sing badly in the Karaoke scene as he is a trained singer and dancer and did neither in this production. The gun toting Stalker (Phil Atkinson) occasionally stood lit up in the shadows, flexing his muscles and flashing his six-pack. When he finally met his end amongst people sitting in one of the theatre boxes, it provoked some laughter. He almost became a pantomime villain, even being booed at the curtain call by the audience who were obviously enjoying themselves. There was excellent musical accompaniment, under the direction of Michael Riley. The musicians often don’t get the credit they deserve. Additionally, there was also clever lighting and laser effects, with interesting video projections and slick scene changes. The evening rounded off with a grand finale. The stage was filled with energetic street/hip hop dancers and dazzling lighting displays for I Wanna Dance with Somebody. All the audience were up on their feet, singing along and having a wonderful time. The Bodyguard continues at the Cliffs Pavilion until Saturday 2nd February at 8pm with Saturday and Wednesday matinees at 2.30pm. DISCLAIMER: * Alexandra Burke will perform the role of ‘Rachel Marron’ at all evening performances only. The producers of The Bodyguard cannot guarantee the appearance of any particular artist, which is always subject to illness and holidays. Please check website for full performance schedule.